The south end of Fort Myers beach is best for south wind to west to northwest. Wind launch is wide open beach with smooth white sand. The gulf waves are 2-3 feet. Bunche beach is NOW closed to kiting however. The Sanibel causeway, before the toll plaza, is best with SE winds to south and SW winds. Conditions range from flat to 2-3 foot waves. 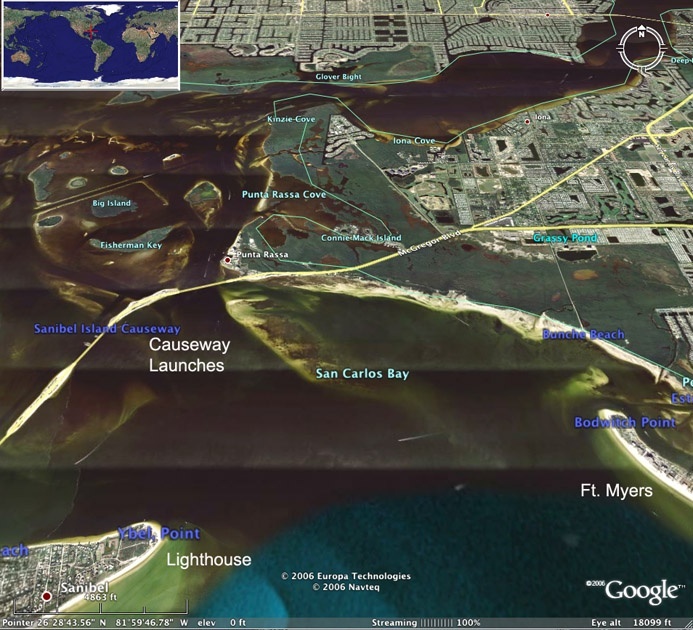 The first island of the Sanibel causeway is best for SW to west to NW winds and it can be flat water to choppy. While kiteboarding here you must watch out for strong tides that can take you under the bridges. 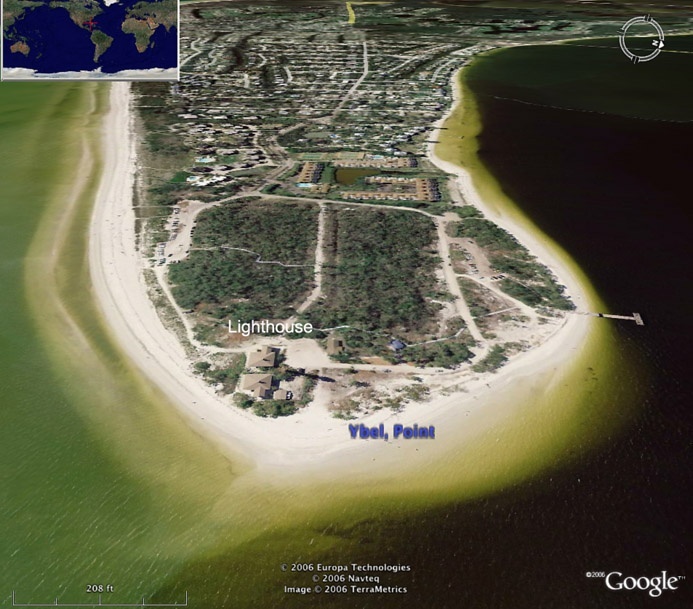 The Sanibel Lighthouse beach is best for NE to E to SE to south to SW winds. The best winds in this area are from October through April when the winds range from 10 to 20 knots during each cold front. Restaurants: Lazy Flamingo, Jacarda, Cheese Burger-Cheese burger, Island Cow. On nearby Captiva Island is the famous Bubble Room restaurant. Our beaches are known for beautiful white sand, beautiful shells and gorgeous sunsets. The back bay of Sanibel offers awesome flat water for blasting speed runs over shallow and deep sand and sea grass beds. The local kiteboard people range in age from 30-60 years. Last edited by RickI; 09-02-2010 at 08:26 AM. I just came across your 'guide' post from several years ago. I wonder if you would have several minutes of free time one of these days to chat? 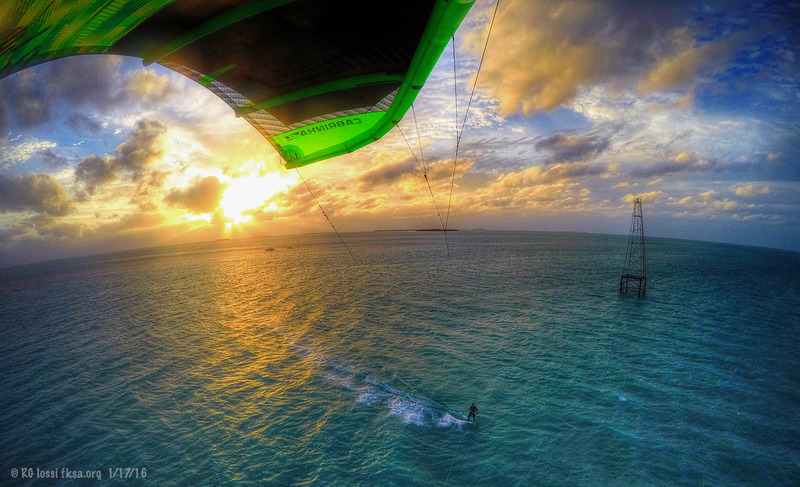 See, I'm trying to create location-specific guides to kiteboarding. Meaning, I want to put together a resource for people who are just starting to learn kiteboarding, like myself. I sometimes got to Floriday, or the Caribbean, and typically it's hard to know Where to kiteboard, or Who to rent equipment from, or What good schools are. So the idea would be to give people such as myself a place to get all the info. I've started to put some info together on fullkite.com, where I started to compile a list of schools, but that's just a beginning. Thanks in advance for any word of advice that you can provide. I would like to know the average wind speed for this period and if it's possible to rent equipment (kite and board) on local shop?? and also the price. Further my investigation seems it's possible to ride on Sanibel Island. I would get in touch with Latino on here, www.swfloridakiteboarding.com for more specific information. The season sometimes ends sometime in May, April can be a real good month. In recent years, normal trends have eased making long term predictions more uncertain. As a rule most shops don't rent kites in the USA, boards are a different matter. I would talk to Latino and see what you can work out. Or may be, if it's not possible i can take only my kite and rent only a board? Do you that only my f-one bandidos 10m (range 12knots till 30) is enough for the spring wind to avoid some additionnal flight charges? If you could pack only one kite, your 10 m with that wind range sounds pretty good. Trying to secure a board locally makes sense although I would make arrangements in advance of your trip. Have a great visit! Florida is the best destination in the world all the places there are amazing and memorable.As here in this post all the guideline regarding the Florida is really very helpful for all and specially for the one who is going first time or planning to go.The most exciting spot i think is the beaches of Florida it is just a beautiful place all over the world.